From the start the front brakes of this used RMZ250 were not very effective. I knew something wasn't right but it was the least of my worries. Then once one of the front fork seals blew out they became soaked in oil and useless. I took a ride over to Paso Robles Polaris and to our surprise the brake pads were in stock. The part number for the front brake pads is the same from the 2005 model all the way up till the new bikes! And seeing how the Kawi and Suzuki are nearly the exact same this makes for much greater parts availability. This is a great advantage. 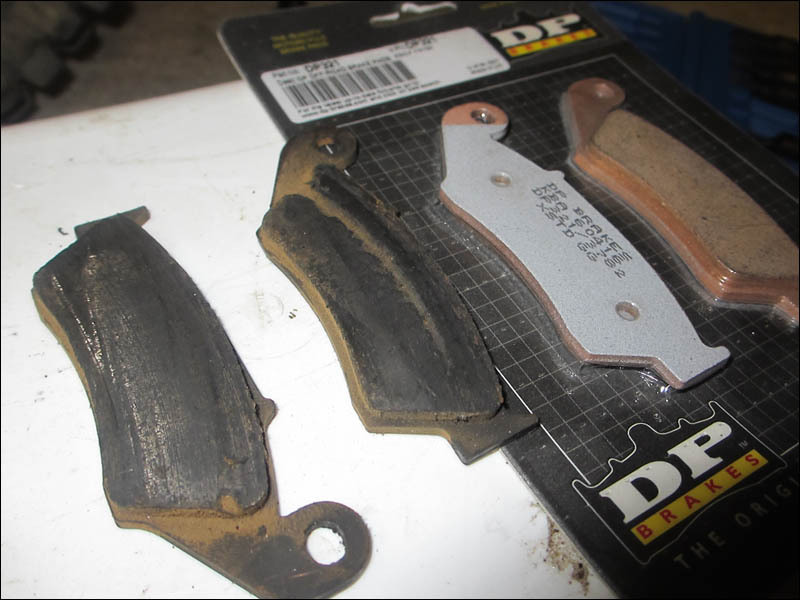 I was lucky to snap up that pair of DP sintered pads. Sintered have more bite and are stock OEM equipment. I would have taken the organic compound just to try it out. They have less bite which keeps you out of trouble if you have a bad habit of grabbing too much front brake. Let's remove the calipers shall we? I love this Husky extendable 3/8" drive ratchet from Lowe's. It was a gift and they can be had for very cheap. 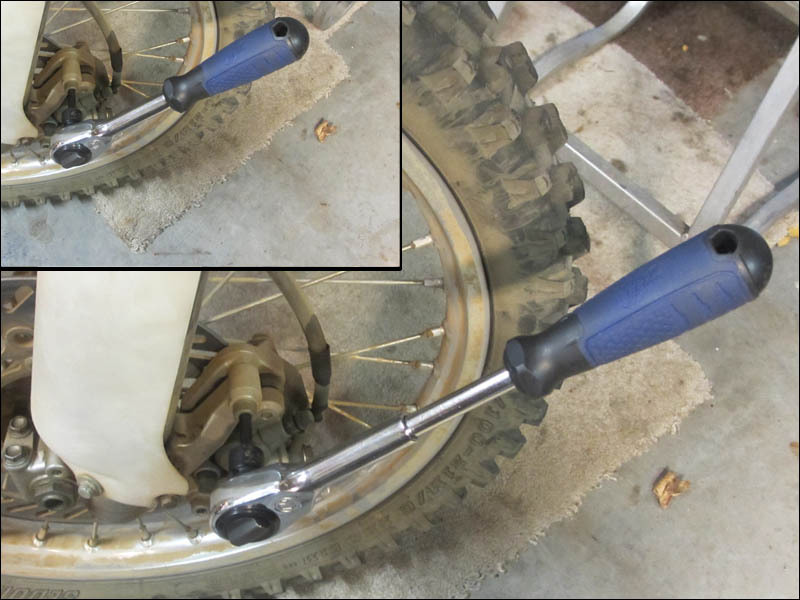 When you twist the grip it will slowly turn the ratchet head for hard to reach bolts. But the best feature is the extendable handle which allows for some serious leverage. The thick handle is easy on your palms when breaking things loose as well. Great ratchet. 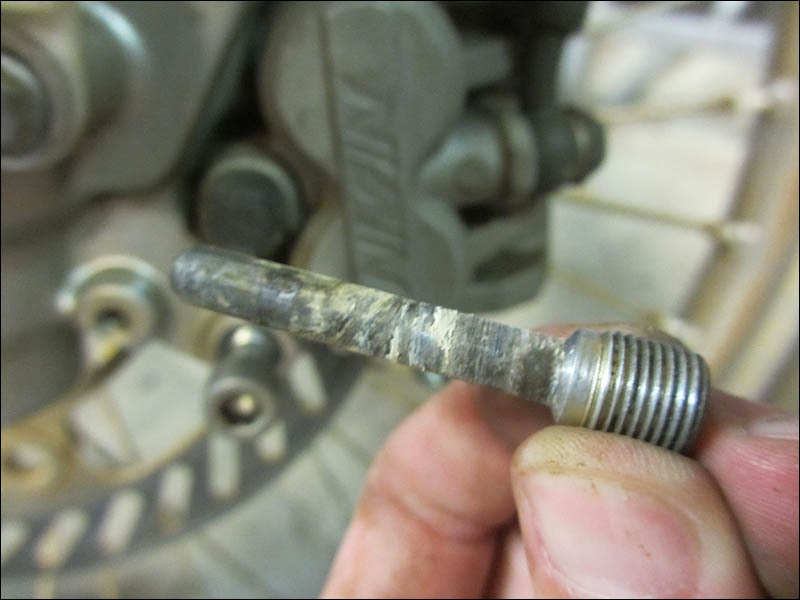 When you pull the pins out of the caliper make sure and use some emory cloth and/or steel wool to polish them smooth. They last forever but you need to keep them clean so the caliper body and move back and forth on them as the brake pad wears thin. Here is the money shot. I expected some contaminated pads to fall out once I removed the caliper but I never thought I would see such damage! 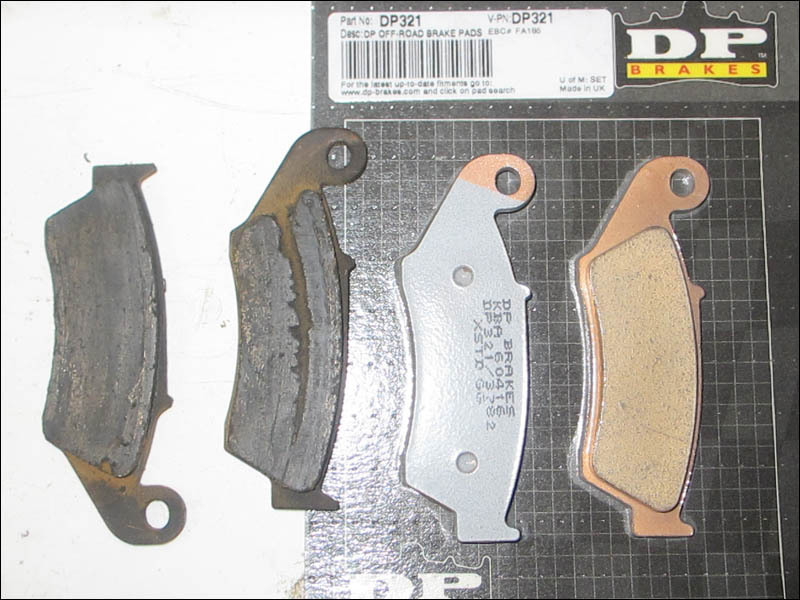 I simply have never seen so much damage done to a brake pad with so much material left on the pad. I would have replaced these first thing in order to prolong the life of the brake rotor but upon looking at them without taking the caliper off I couldn't tell. Besides the obvious damage you can see the contamination on the pads. I can't wait to try the new brake pads now. Besides the additional surface area and lack of crud on the pads the whole brake assembly will work much better now that the pins allow the floating caliper to "float" freely now that they are clean. This will let the pads apply their clamping power evenly. More pics to come. The brake retainer clips are tricky.